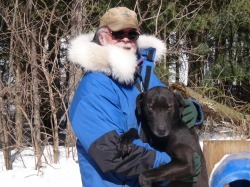 "Peace & Serenity Living In The Northern Forest Not The Best For Racing!" I would never give up the peace & serenity of the forest for city life! However, if you want to race your dogs, going to the races can be dramatic & unnerving. Such was the case at the race in Valcartier last weekend. The dogs were all set & ready to go, with exception of the Leaders who were overwhelmed by the noise & the spectators. About 100 yards out of the start shoot the leaders decided they wanted to stop & the Point Dogs jumped over them to become the new leaders. This action lead to a major tangle resulting in 3 minutes of lost time undoing the mess. But that wasn't the last of the challenges with both leaders stopping twice EACH to poop on the trail leading to 4 more tangles. The good news is after all was emptied, the team finished strong. These adventures cost us a minimum of 7 minutes. Unfortunately, I wasn't feeling great on the Sunday & made the decision not to race. The coarse at Valcartier was great & a very well organized event. Today, we hooked up the dogs to prepare for L'Epiphanie Race this coming weekend. It was also Halona's first run in a team & she did great. Tomorrow the high temperature is -20 with the morning temperature at -30 with a wind chill of -40. I am sure happy we changed the straw in the dogs houses today to give them a nice warm bed. No training tomorrow!